Bring on November. I’m so ready. The holidays start on November 11th here in Germany and we are already looking forward to our Martin’s goose. The menus is always exactly the same: goose, red cabbage, potato dumplings, and chestnuts. It’s SO good. 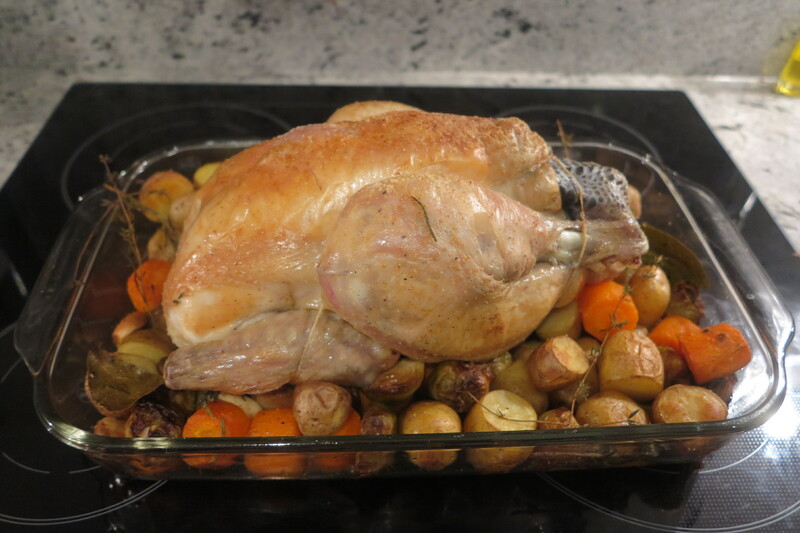 But in the meantime, we have this week’s French Friday’s with Dorie recipe, Hurry up and Wait Roast Chicken. The “hurry up” seems to refer to the high oven temperature and the “wait” part to the fact that you have to let the chicken rest for 15 to 20 minutes after to comes out of the oven. Well, after reading that last part I just thought that there was no way my husband was going to be able to stand this recipe. I’m usually chasing him out of the kitchen so I can let the roast bird sit for 5 measly minutes, how the heck was I supposed to keep him away from it for 15 minutes? Dorie introduces this recipe by pointing out that France is the land of pedigree chickens. So off we set to the market to see if we couldn’t find a well bred bird. 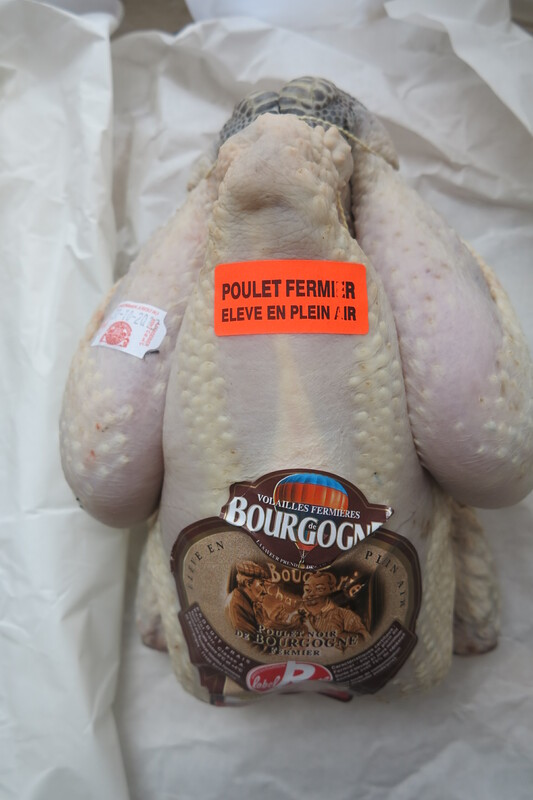 Which of course led to the question, why do French chickens always come with their feet (or at least part of their feet) still on? My research is inconclusive, but yielded two interesting theories. Theory 1 is that it is proof of pedigree. Not knowing much about the difference in pedigrees, this doesn’t help me much. Theory 2 is that it is somehow a sign of freshness because the feet will change color as the bird ages. But again, since I have no idea which color to look for, this is also not much help. If you know the truth, please share. So, we had a designated cook and a bird. I threw some veggies into the mix and into the oven it all went. And then back to give it a turn (thank goodness for silicone oven mitts). And then back to give it another turn. And then started the waiting. In the end we survived the waiting and agreed that our chicken was very tasty. But all that running back and forth to the oven was not for me. I’m more of a Lazy Chicken kind of gal. Ha! Way to pawn off the dirty work! Just kidding. I have no clue about the feet. Italian supermarket chickens often have scaly ankles still attached, but I get the impression that it’s sloppy butchering rather than proof of pedigree. I could be wrong. I know – that waiting wasn’t fair! we resorted to having a slice of bread while waiting. I did all the prep work, but relied on John to turn the sucker as I could just see me shooting it across the kitchen and ending up feeding it to the cats for dinner! LOL! Way to go – team work! Your bird looks great and I wish I had silicone mitts. I had a bit of an interesting time with my turning process! It’s great that your hubby took over the cooking for the evening. Your bird looks great! I agree it was a bit to fussy…I’m also a Lazy Chicken kind of gal! Have a great weekend, Rose! Too funny! I prefer Joel Robuchon’s method which is slightly longer, but more juicy and flavorful. Sous chef is pretty patient with waiting since I’m a tad leisurely in the kitchen. Your chicken looks pretty amazing! Love that you posted a photo with chicken with their feet – looks like it has good pedigree too! Your silicon mitts are cool! Envy the team work in your kitchen. My chicken came with feet, head along with the neck, liver and the gizzard nicely tucked into the cavity! And I am so gonna try the lazy chicken recipe next! Rose, how nice that your husband assisted you in the kitchen – you bought one wonderful chicken there…and the roasted chicken looks absolutely perfect and delicious with all those herbs and veg. Have a great weekend – the weather still seems to be warm for this time of year! I think the consensus was that this was yummy and fun to try, but that most of us would rather take the lazy route! Me included. Hope you’re having a great weekend! Genius way to address the issue of waiting- you had me LOL ! Yup- my guys are always hanging out waiting simply for the picture taking process so the the additional wait time was not appreciated when the kitchen smelled that good. With no silicone mitts here the flipping was more of an adventure. We enjoyed this but will not be revisiting it. Yes, also looking forward to the holidays here – even if ours start a bit later. 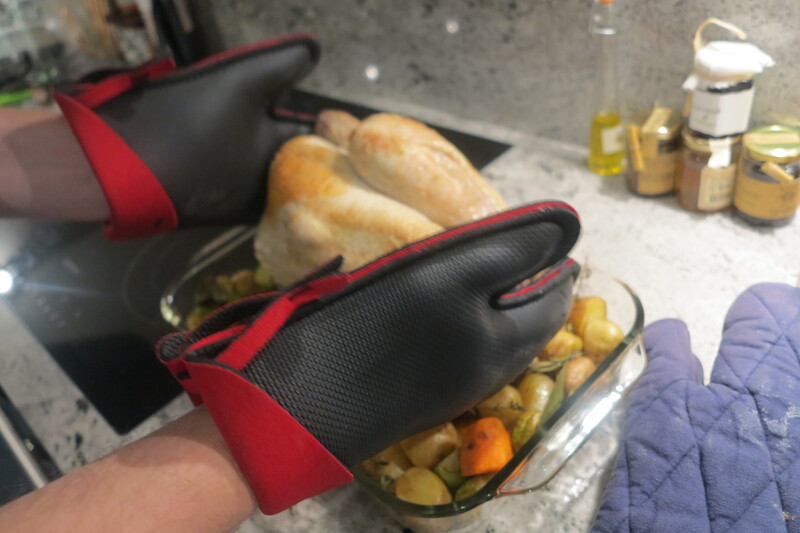 Those silicone mitts look like the secret to turning the chicken with ease. I’m with you, though. I prefer Lazy Person’s chicken. I adore it, and it’s no fuss, even if this one is a little moister. Happy Holiday Season! I was at the mall on Friday (searching for World Series gear) and was amazed that they were already piping Christmas carols over the sound system. With all the Halloween stuff still displayed (on clearance), I’m not sure it actually put me in the mood. It’s too early! I am not sure I am ready for the holiday season, but it is here so might as well roll with it! Everybody’s posts this week have made me very curious about pedigreed chickens. I kind of want to order one just for comparisons sake, but they’re so expensive! Your holiday dinner sounds delicious. I’ve never tried goose but would love to. As I’m traveling around to French Friday posts my list of kitchen supplies is growing! Now I want silicone mitts too! I don’t know where I’d find a chicken with feet or good breeding in Oklahoma City so I had to settle for an organic one from the supermarket. Mine cost $17 so I can’t imagine what a pedigree chicken would cost! My husband used to travel to Germany a lot and always loved the Christmas Fairs or winter carnivals or whatever they are called. We have a collection of gluhwein mugs that he’s brought home and serving gluhwein to friends is one of the pleasures of fall and winter! Your final chicken shot is beautiful! Like everyone else, I will skip all that flipping next time, but it was a great meal. One thing I miss about my parents’ farm is the roasting chickens they used to raise. There are probably better birds out there, but not many. Your pedigreed bird looks like one of them. I didn’t mind the flipping too much, but I was doing other things in the kitchen, so it wasn’t too much of a bother. I love the silicone mitts – they would have been a real help.